Welcome to Loleta's Own Homepage! Ask not what your Loleta Community can do for you, but what you can do for your Loleta Community! WHATS GOING ON IN LOLETA? There are many ways you can get involved in this community! Make a difference, volunteer and get involved. History Timeline is being built on the Loleta History Facebook Page complete with photos old and new. Also visit OLDPHOTOGUY.COM for more historic photos. Loleta is a small town in Northern California which it's name, Lo Le Tah, came from three Wiyot Indian words meaning "a pleasant place at the end of the water." It's former name was Swauger's Station named so after the railroad depot built on land owned by rancher Samuel Swauger. The name Loleta was adopted by the community in 1897. White members of the community were doing no more than adopting the name that the local natives had been using for many years. Will Perrot was the first to make the name official when he filed a map with the County Recorder titled 'Loleta - Amended Map of Swauger's' in Feb 1987. The railroad company made it official Jan 1, 1898. The name of the post office was changed April 1, 1898. The name Loleta was adopted by the community in 1897. In 1886 the Eel River and Eureka Railroad built a depot called Swauger's Station on property owned by Samuel A Swauger. It was one of three shipping points in the Table Bluff township, an area from Singley Rd to the ocean. From 1884 to 1886 the station amounted to no more than an uncovered loading platform standing beside a short length of track. In 1898 as traffic increased a new and larger depot was constructed to serve untill 1912, when a waiting room and traffic office was enlarged. More businesses and people started moving in. An old Humboldt County "Great Register" for 1888 indicates Samuel Swauger ranched on what is now Loleta and had registered as a voter in 1887. He was 59 years of age at the time and a native of Pennsylvania. The Swauger post office opened in 1888, and changed its name to Loleta post office in 1898. The Creamery Association in Loleta was established in 1893 as the Diamond Springs Creamery, a co-operative of the Golden State Creamery (Schwarzkopf 1948). At its last Creamery operations it was known as a division of the Humboldt Creamery, Loleta's creamery has known several owners, company names, and produced various dairy products. The creamery has known as many as seven names before the Humboldt Creamery Association bought it in the late 1980s. Milk, cheese, condensed milk, butter, casein, and powder ice cream mix are many of the products the creamery has produced over its many years of operation (Parry 1963). Probably the most well known product is a powdered milk marketed under the brand name of "Milkman." Milkman is a high quality powdered milk which was developed at the Loleta plant by Golden State in the 1950s and 1960s and was produced until it closed in January 2008. (Laffranchi 2002) (Loleta Community Report). The elementary school had 46 children. 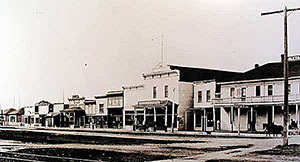 In the summer of 1889, Pacific School (Changed to Loleta School Dist in 1911) was moved to the edge of town at the foot of present day Main Street. The first year in town it had 16 pupils. By 1895 another school was started and completed by 1896. By 1899 both buildings were so full another new building was constructed and ready by 1900. "The Swauger (Before name change to Loleta in 1897) Community Church had been started and erected under the supervision of Rev. Jasper who came to the town in 1895. Rev Jasper also started a small newspaper which he later moved to Fortuna and published it under the name of The Humboldt Beacon." Taken from Olga Svendsen Matthiesen Family Journals. Community Evangelical Free Church of Loleta, California filed as a Articles of Incorporation on Saturday, June 25, 1898 in the state of California. "Wobbling on foundling legs from the beginning, the Loleta Volunteer Fire Department was formed on the night of February 16th, 1900 in Dickson's Hall." It consisted of seven elected officers and a triangle that hung near the Hotel was used as an alarm. Those officers were: Clinton Shaw, Joseph Hodgson, Edwin Meller, Louis Olsen, Fred Smith, Robert Dickson and Frank Bertsch who jointly received $223 from local merchants in donations for purchase of fire equipment. In May of the same year, the firefighters took delivery on a handcart and three hundred feet of two-inch hose. The necessity arose to have fire hydrants so Frank Bertsch and Will Parrott of the Loleta Water Works installed hydrants on the water main. Lack of fires to fight caused interests to weaken and during the tenure of Edwin Meller, Joseph Hodgson, Cornelius Rasmussen, Moses C. Poyfaire, Hans C. Hansen, and H. R. Williams. The department threatened complete dissolution during 1901. Table Bluff Township was located northwest of Loleta off the Table Bluff to Eureka Road (Hawks Hill Rd). Five of them were Diamond Springs Creamery (1893)L. Wolf (1898), Sunset Creamery Co. (1900), John George (1902), and Eclipse Creamery Company (1903). James Jensen, a long time Loleta resident said, "In the early 1900's Loleta had three General Stores, three Saloons, two Hotels, two Livery Stables, two Blacksmiths, two Harness Shops, one Meat Market, one Drugstore, one Lumber Yard, one Plumbing Shop, one Creamery, one Doctor and one Dentist." Exerpt taken from Swauger's Station Cookbook printed in 1982. Electricity Comes to Loleta in 1905. Ladies Home Journal 1906 Article "The Small Town of Loleta, CA has a club of 10 women (the Los Amigos Club) who wrote that they did so little that it hardly seemed worth relating, yet that little includes the care of a park of 5 acres which they as trustees keep attractive and beautiful. All improvements are put there by the club and these women have installed electric lights in the town making monthly donations to the minister's salary and have $500 in the bank. When that amount reaches $700 they will build a clubhouse in the park. All this was set forth in their report without consciousness on their part of having done anything of importance." A well know hot spot had taken hold in Loleta. A park that included a barn - still standing - used for dances and picnics. The park was on 5 acres and encompassed an area from the rail tracks to what is now the 700 block of scenic drive to about the same portion of Franklin Avenue. The club formed in order to be caretakers of the park. People would come by railway to these events -- an all day event once a month at the park. Anywhere from 1500 to 4000 people would come to this event. The Los Amigos ladies provided all the food - boxed lunches and dinners and kept everything going as well as keeping the grounds. Los Amigos pay to have streetlights installed in Loleta Jul 1, 1906. As per Los Amigos club minutes, the club contracted to have streetlights installed in Loleta and paid the bill until 1930 when taxpayers took it over. 1908 Table Bluff Rancheria established, 20 acres gifted by a local church. 1953 Tribes terminated via Public Law 280. 1981 Rancheria recognized;102 acres purchased nearby by federal government as part of a lawsuit settlement. 1982 Established tribal constitution. A historic bank building, Bank of Loleta. 358 Main St., Loleta. In 1905 Robert Dickson and his nephew, Walter, Operators of the Dickson & Dickson General Store took steps into the business of banking. November 18, 1905 the State of California Banking Department records show their application as co-partnership. They expanded their services to the Loleta community providing safekeeping for the farmers' and ranchers' hard-earned cash. The service was free of charge. They later began to invest and loan for their customers. In 1908, it was one the better managed of over 500 banks in California. In 1920, the new Bank of Loleta Building was built two buildings down from its original location in the Dickson & Dickson General Merchandise store, which also housed the post office. The new bank, designed in Roman Doric style had a recessed entrance flanked on either side with free columns made of reinforced concrete finished with imitation Raymond granite. In June 1985, the Loleta Branch building was added to the National Register of Historic Places, when it had 5 branches including location in Fortuna, Ferndale, Eureka and Arcata. It was bought out by US Bank in 1988 later closing the Loleta Branch. The building now houses the Loleta Community Services District Office. Architect, builder, or engineer: Georgeson,Franklin T. Architectural Style: Classical Revival. Period of Significance: 1900-1924. Before the end of 1918, $1600 had been donated and a Model T Ford, La France chemical fire engine with a hand crank to start the engine was purchased for the Loleta Volunteer Fire Dept. The Baseball Diamond was moved to the Loleta Firemen's Park in 1925. The Dairymen's Association helped the firefighters build a grandstand in 1929. The cost of the flood lighting for the diamond was shared by the firefighters and the Chamber of Commerce, each paying $500. In 2009 Glenn Shewery and his dad organized the renovation of the field and with the funding of Bear River Casino, there is a beautiful functioning Baseball park being used by Eel River Little League. Fred Shock was the Fire Chief during the land acquisition and pavilion construction activities starting in 1925. Pat Carr sold land to the association, which was suitable for building and not for farming. Fifty-six community members and farmers combined resources to buy the land and additional funds were raised ($15,000), to build the pavilion. Frank Bertsch built the Firemen's Pavilion with the help of the men in the department. Chris Hansen bought maple flooring at cost for economy in construction and dances were organized by Fred Shock and Johnny Holt to raise funds to pay off loan notes. Dances were held in the Loleta Dance Hall for benefit of the Fire Department and drew huge crowds with prominent named bands appearing and occasionally two bands played at once, one at each end of the hall. Local bands found Loleta dances a good place to acquire publicity since crowds sometimes numbered in the thousands. Receipts for one night were to be from $1,600 - $1,700. Names were drawn to determine which loan note was to be paid with the receipt funds. During the "twenties", occasional smokers were held. According to Fred Shock, hookers were brought in from Eureka to provide stripping entertainment for a strictly stag audience. "Of course", Fred Shock says, laughing, "We let it be known far and wide that the Loleta Fire Department had nothing to do with it". In 1959 the building that occupied the corner of Railroad (Market) and Loleta Drive burns to the ground. It once held one of Loleta's Livery Stables and Saloons and was said to also have been a Theater. 1970's the Lighthouse Ranch Gospel Outreach was a Christian Church which emerged in Northern California in 1970 as part of the Jesus movement. The ranch was acquired by real estate agent and pastor, Jim Durkin who purchased 8 acres (32,000 m2) of the surplus Coast Guard property from Norman Kenneth Smith, an evangelical minister, in 1970. Renamed "Lighthouse Ranch," it became a stop over for young adults seeking spiritual direction. Young travelers visited, some stayed, building alternative dwellings such as geodesic domes out of wood, and working the land. Building plans were published in the Whole Earth Catalog as part of the Back-to-the-land movement. The ranch was subsequently owned by Sabine Ball a German evangelist and manager of social projects who, in later years of her life, returned to her roots in Dresden, Germany as a Christian evangelist. By 1972, Gospel Outreach Lighthouse Ranch had grown to almost 300 members. The group started attending a local Assembly of God church in Eureka and asked the minister Jim Durkin to lead Gospel Outreach. Within a few years the Lighthouse Ranch sent out planting teams all over the world. Throughout the 1970s and 80's, missionary teams established churches in Palmer, Alaska, Chicago, Brooklyn, New York, Silverton, Oregon, Philadelphia, Germany, United Kingdom, Nicaragua, and Hawaii. With 100 affiliated churches worldwide the Gospel Outreach network is one of the denominational legacies of the Jesus People Movement. In the 1970s Jim Durkin preached a pivotal message "God's Purpose And Vision for your Life" that was very similar to the message later developed by Rick Warren. Durkin also emphasized repentance, as in a need for a follower of Christ to experience a "turning away' from past wrongful behaviors. This concept was readily understood by young people who had recently identified themselves as hippies. Durkin practiced what he preached, as he himself was a compassionate, humble, encouraging and caring individual who emphasized the importance of considering the needs of others first, and the personal growth of each individual. The name "Gospel Outreach" reflected the words of Jesus, "And he said unto them, Go ye into all the world, and preach the gospel (good news) to the whole creation. (wikipedia) Title of Event: D'Arcy Fallon presents So Late, So Soon: A Memoir. When: Monday, August 9, 2004 7:30 PM. Location: Annie Bloom's Books. Description: D'Arcy Fallon offers an irreverent, fly-on-the-wall view of the Lighthouse Ranch, a Christian commune she called home for three years in the mid-1970s. At 18 years old, when life's questions overwhelmed her and reconciling her family past with her future seemed impossible, she accidentally came upon the Ranch during a hitchhike gone awry. Perched on a windswept bluff in Loleta, a dozen miles from anywhere in Northern California, this community of lost and found twenty-somethings lured her in with promises of abounding love, spiritual serenity, and a hardy, pioneer existence. What she didn't count on was the fog. Hermetic Science played a surprising number of live shows in northern California between April 1996 and May 1998, after which they withdrew from the arena of live performance in order to devote themselves single-mindedly to recording their second CD. Working with engineer Tim Gray at Big Bang Studios near Loleta, California, the band recorded much of the album in late September and October 1998, the remainder in May 1999. With the release of their second CD, Prophesies, in September 1999, once again under the auspices of the Magnetic Oblivion label, Hermetic Science definitively emerged as one of the most original and accomplished progressive bands of the second half of the 1990s. The lighthouse and it's buildings were leveled and are gone in 2012. Loleta Antique show established in 1971: In 1971, the benefit program of the department was altered to include an Antique and Country show. This was more effective and desirable than the previous method of going door to door selling fruit cakes. Held the second weekend in October, the annual Loleta Antique show continues to be the most successful form of fund raising for the department as well as a much anticipated event for the surrounding community. In 1979 the grounds around the pavilion was named the Thomas Carr Park honoring Tom for his many years of service and upkeep of the pavilion and grounds. Also, 1979 brought the department it's first two women to join the department; Paulina Petersen and Wendy Lougher. Ads posted in the back of the Swauger's Station Cookbook printed in 1982 include: Loleta Meat Market - Louis and Larry Biondini, Stoneware Potters - David and Bosha Struve, "The Future" Loleta Cheese Co. - Bob and Carol Laffranchi, Fidjeland Farms (Potatoe Farm) - Don and Dave Fidjeland, Foremost-McKesson Loleta Grocery Products Division, McColl's Dairy Products Co - Jim Pedrotti Ice Cream Distributor, Jacks Loleta Grocery, Wagon Master of Fortuna - Stan Smith Sr & Stan Smith Jr, Marvin Fork General Contracting, Familiar Foods Inc of Loleta, Ken's Shell Service - Ken Wells, Loleta Volunteer Fire Department, The Gilded Rose & Friendly Corners Dining - Gildesgard's Prop. and Les Stanley, Bank of Loleta, Kennebac Potatoes by James S O'Neil and James M. O'Neil, O'Neil Construction - Jeff O'Neil, and Loleta Chamber of Commerce. The out of print cookbook was found in 2010 on Amazon.com by a descendant of Swauger hosting a reunion in Pensylvania. He found LoletaOnline.com and inquired about finding a copy of the cookbook and more history of Loleta for the Family Reunion. In the future he'd like to attend an annual Swauger Station day event with his family. Sign the Guestbook below and leave your comments about Loleta History! If you have anything to add,send an email! In the state legislature Loleta is located in the 2nd Senate District, and in the 1st Assembly District. Federally, Loleta is located in California's 1st congressional district. Local Institutions include: On Main Street, a grocery store, a meat market, a bakery, a realty office, and a post office. Close to the freeway is the school, Loleta Elementary, a Catholic church and a Protestant church. There is an independent media development house, Bandicoot12 Studios. The most notable building in town is the firefighter's pavilion, managed by the local volunteer firefighters. The town is well-known for the Loleta Cheese Company, which ships cheese worldwide. The Bear River Band of the Rohnerville Rancheria is headquartered in Loleta, where they operate the Bear River Casino and Hotel. Popular culture: Loleta and Eureka were locations for filming the 1982 horror movie, Halloween III: Season of the Witch; scenes inside "the Silver Shamrock Novelties factory" were filmed in a former milk bottling plant for Familiar Foods on Loleta Drive at Railroad Avenue, while street and location scenes were filmed in and around Loleta. The Northwest school mystic artist, Morris Graves lived in Loleta from 1964 until his death in 2001, in a house designed by Seattle architect Ibsen Nelson. Drive (The X-Files), Season 6, Episode 2 of the hit show X-files, features Loleta momentarily near the end of the episode. Visitors Planning a visit to the area? Loleta has quite a bit to offer. Scenic roads with various views of old abandoned as well as thriving farms and dairies, beach drives and beautiful sunsets to name a few. Don't forget downtown with its quaint and eclectic assortment of shops and people which you will find very friendly and hospitable indeed. Don't miss Loleta's latest addition to the Cheese Factory, the Queso Kings which has become a hit and regular hot-spot for locals from neighboring towns as well as out-of-town frequentors! Also check out the garden and gift shop in the Loleta Cheese Factory, a family owned business that is a favorite with tourists as well as local regulars where you will find delicious Award Winning cheese. A little fun, dining and dancing can be found at Bear River Casino which is ever expanding it's convenience for you. Lodging is available at the casino. Also newly re-opened is the Angelina, a delicious restaurant and bar located a few miles away on Fernbridge Drive. And remember to get a good look at the Old Brick Creamery Building whose future is unknown but it's Historical Importance is well established. The beautiful building is a favorite with local Portrait Photographers and you might be able to snap a cool picture in front as well. Whether you are here temporarily for a seasonal job or school, or a more permanent resident, you will find that Loleta is a quiet and friendly community with much to offer! With it's expanding neighborhoods as well as long-time residences and several generations of families, there is rich history here as well as many civic and social needs for improvement. You have opportunities if you like, to make a difference in the community! Riverwalk RV Park & Campground, 2189 Riverwalk Dr., Fortuna, CA 95540 (800) 705-5359 or (707) 725-3359 RV Campground with full hook-up (water, sewer, electricity) for $15 per night is available. They have 100 sites. Humboldt County Fairgrounds	1250 5th St. Ferndale, CA707-786-9511 (Available on a first-come, first-serve basis, except during fair time) Tent Camping: Grassy area accommodates tent campers, with access to restrooms and showers. $10 per night. Overnight RV Parking: Up to 100 spaces available (depending on time of season) with water and electrical hook-ups. Available to large groups with advance reservations; available to individual RVers on a first-come, first-serve basis. $20 per night. Spring Drinking Water Delivery: Crystal Springs (707) 443-7171 or McClelland Mountain Spring Water (707) 268-0254. There are many ways to get involved. Here are a few choices. Is a four-year effort addressing issues around communal spaces and community relations in Loleta. The Loleta Local Organizing Committee (LOC), composed of diverse community members, is leading the effort and welcomes all residents of the Loleta region to get involved! The LOC has addressed priority community issues including partnering with the Loleta School to implement new school discipline programs and creating a central place for communication - the kiosk - at the downtown Loleta park. The LOC is now working on improving the park downtown and expanding recreational opportunities. Established in 1906, This women's club meets on the third Friday of the month at noon for a luncheon and meeting from September to May at the clubhouse on 733 Scenic Drive. The club raises money, most notably with the Loleta Antique Show in October manning and selling food in the cafeteria during the show and holding a raffle during the show. The proceeds they raise help fund the clubhouse maintenance as well as donating for school functions, the Community Medical Mobile Unit and the Rescue Mission. See the History Page for notable past Los Amigos Club accomplishments. Each of our volunteer organizations often overlap and help each other, getting involved in community events. • JULY: SWAUGER STATION DAY -- The second Sunday of July. Swauger Station Day is the original name of small community and once a year we celebrate our community with a deep pit barbecue, vendors, music, Tour of Loleta bike race, & games for the whole family. Organized and sponsored by the Loleta Community Chamber. • AUGUST: COMMUNITY WIDE GARAGE SALE -- Date announced. Organized by the Loleta Community Chamber, community members can have a garage sale and the chamber advertises and puts you on a map. • OCTOBER: LOLETA ANTIQUE SHOW AND BARBEQUE -- The second weekend in October put on by the Loleta Volunteer Fire Department. A major fundraiser by the department and cooresponds with local children's fundraising who head up the parking and the Los Amigos Club who provides food and refreshments during the 3 day show. The Fire Department uses raised funds for upkeep of the Fireman's Pavilion, in which the event is held. • NOVEMBER: ANNUAL FLEA MARKET -- Date announced. Organized by the Loleta Fire Department and held in the Firemen's Pavilion. • DECEMBER: DOWNTOWN OPEN HOUSE & SANTA CLAUS -- Date announced. Organized by the Loleta Community Chamber and the Loleta Fire Department. Office hours are from 8AM to 2PM Tues thru Fri.
LCSD Meetings are held 7PM the 3rd Thursday each month at the Fire Dept. Meeting Room. Yes we have a bit of a Hard Water problem. It has been worse, but even now, there are some things we do or can do to deal with this issue that won't go away anytime soon. a common issue among small towns. As with anything else, we can learn to get by from tips shared with each other. If you have anything to add, send a note and it will be posted. Every once in a while, bleach will react with the water and turn it-along with your whites-dingy brown. Test the bleach in a sink full of water first to make sure it doesn't turn the water brown before you use it in the laundry. Iron-Out - sold at hardware stores and Walmart can be used in place of bleach if there is a browning reaction. It behaves like bleach so use caution. If your laundry detergeant isn't disolving in the laundry, try adding about a 1/4 cup of salt to the wash to soften the water. If your laundry in the washer seems to sour very quickly - if left even for a few hours before drying - it may be the type of detergeant. Cheaper detergeants seem to sour faster. Leave the washer lid open between washings to prevent more souring. If your dishes develop mineral deposits, use white vinegar in the rinse water to disolve the spots. It can also be used on shower doors. For the Dishwasher, vinegar and a little salt if the detergeant isn't desolving can be used, or a product called "Lemi-Shine" works great and can be found at Walmart and maybe other stores (if you know send a note). Hard water and bar soap is a lethal combo for quick and dirty showers, sinks and tubs. If you can adjust, switch to liquid body soaps which are better for skin too. Using daily shower sprays and/or squeegees also really extend the clean shower and tubs. Be careful though, you may become spoiled by not having to clean the shower and tub regularly. When the water goes through a brown spell, toilets, sinks and tubs get scrungy fast. A daily wipedown, swish or scrub without any cleaner can get you through. For Hard Mineral Deposit lines in the toilets, a pumice stone can rub them off (can be found at hardware stores or Safeway). Use only on porcelain. The dollar Store is a great place to shop for cleaners, scrub brushes and shower curtains. "The Works" toilet detergent is great for hard water stains in toilets! To avoid hard water spots, wash in late afternoon or in overcast conditions and dry off right away. If you wash often - (not me) - you don't even need to use car wash soap every time ( a tip from an auto body man).